Looking for a super cute Halloween sandwich recipe for kids that will fit perfect in their lunch box? These ghosts are insanely easy to make and can be customized to your child’s tastes. They’re also the perfect snack for an afternoon Halloween party! I love making my son special little treats to celebrate the holiday, but let’s be honest, I’m not exactly a master chef. I’m also a working mom, so I don’t really have time to spend hours whipping up elaborate recipes every day, especially for a lunch box! I go for the quick and the easy as often as possible! Last year, we shared this incredibly adorable monster bento box that all of our kids really enjoyed. We’ll definitely be serving that up again this year, but we also wanted to surprise them with something new. Our recipe uses turkey and mozzarella, but you can use pretty much any deli meat and cheese that you prefer. You can even use veggies or other ingredients if you want to go meat-free! If you’re serving these at a party, consider mixing them up a bit and making a few with the turkey and a few with other meats. Ready to see how easy it is to make? Don’t forget to print out the recipe card so you have it for later! 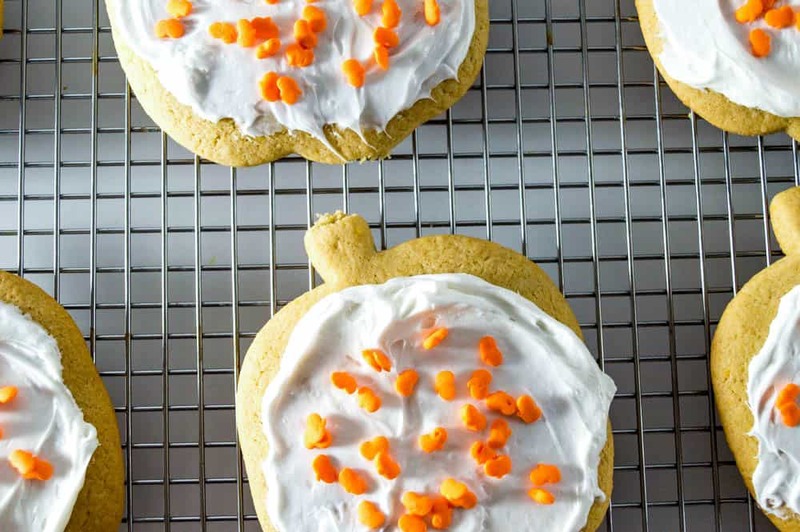 Using your cookie cutter, cut out each ghost shape with your bread, then set to the side. 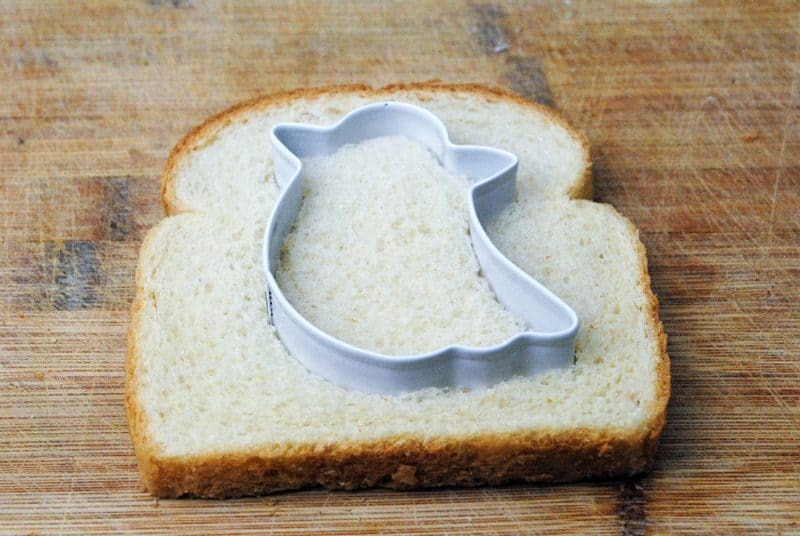 Now to assemble, lay 1 ghost bread cut-out on your work surface and top it with the sliced turkey and cheese. Top with the second ghost bread slice. Repeat three times until you’ve used all your ingredients. Repeat three times until you've used all your ingredients. If you do plan to add condiments, I suggest leaving them off the sandwich and serving them on the side. In a lunch box, you could send along a little container with mustard, mayo, etc. For a party, just scoop some of each out into a festive serving bowl and let the kids do it (or give younger ones a hand). I find that adding condiments too early can make the whole thing a big, soggy mess by the time you’re ready to eat it! Looking for more spooky fun Halloween party recipes for kids? Check out a few of my favorites! 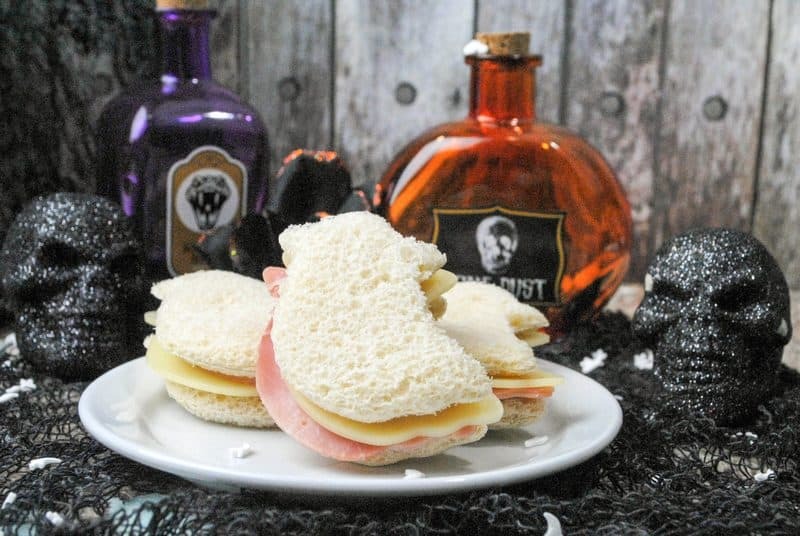 Do you make a special Halloween sandwich recipe for kids for their lunch boxes or parties? Share in the comments! 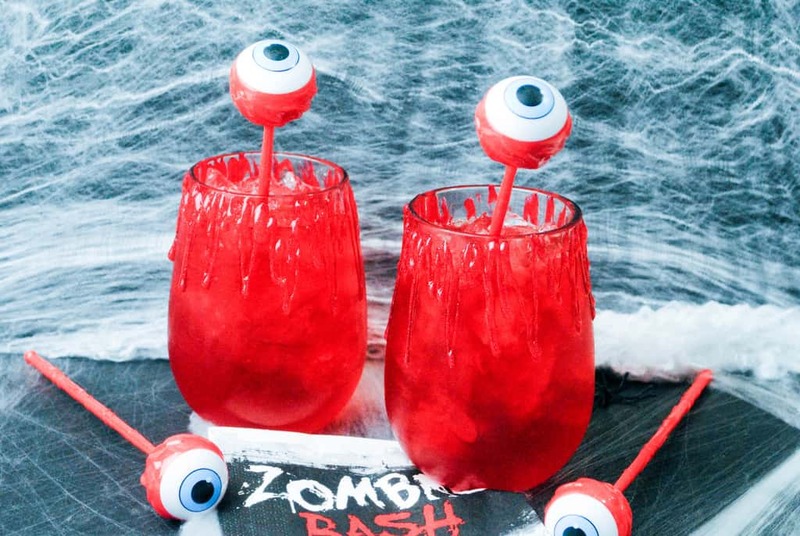 These ideas are perfect for Halloween. I think it would be a huge hit with my grandkids. I love the data on your web sites. Thanks a bunch!. Purple Eyed Monster Halloween Cupcakes are so cute,i think im going to try those! 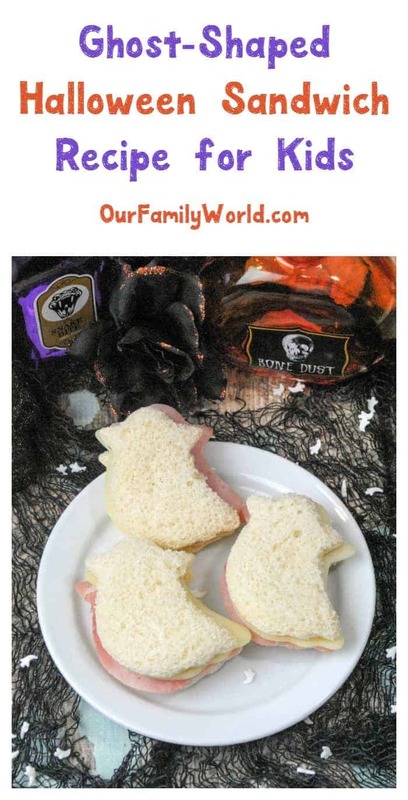 That is such a cute idea for a Halloween themed sandwich! I bet my kids would love a ghost-shaped sandwich in their lunches! Thanks for sharing. I love your Halloween recipes!!! This Ghost Sandwich will make lunchtime or snacking at school for fun. How cute! This is such a fun idea for kiddos lunches! I am definitely going to surprise my little guy with this this week! What a creative and ingenious idea! I never thought of this before. I should have that cookie cutter.. These are so cute! I think I’ll share this with my little nieces. They would have so much fun making these with me. Those are super cute. I know that my youngest would get a kick out of it if I surprised him with ghost sandwiches in his lunchbox. 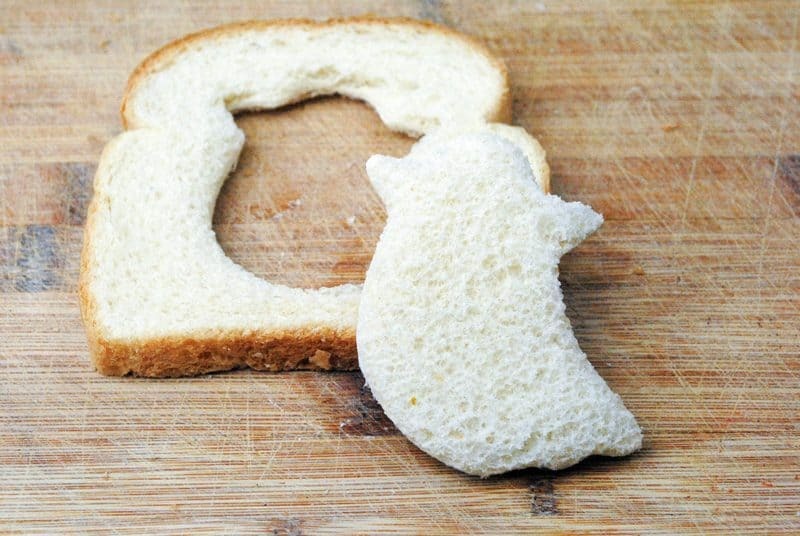 Ghost shaped sandwiches are a fantastic idea. I will have to make some for the kids lunches this week. These treats look delicious to. We love Halloween time. I need to start making things with Halloween cookie cutters. I love these sandwiches! My youngest loves to eat sandwiches, so I bet she’d really like these. So many cute Halloween party ideas, I love it. I will have to find a ghost cookie cutter. The cupcakes and cookies are super adorable too. OK I LOVE those Purple Eyed Monster Halloween Cupcakes! I love the sandwiches too! I love how creative people are with food! I love the sandwich and I love all the other recipes you showed here! Halloween is the best time of year for themed recipes. Yay!